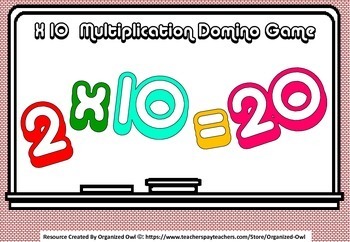 This download consists of three separate domino games focusing on multiplying by 2, 5, & 10. Each domino game comes with 48 tiles (cards). Based on ability there is an option of leaving out or including half the tiles. 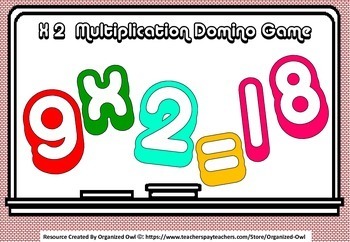 There is also the option of printing as many ‘sets’ or ‘individual’ dominoes, it all depends on the needs for each math group. This game is played like a regular domino game where cards are placed next to another creating a match. With multiplication domino children need to match up correctly a sum next to (along side) the correct answer, for example the sum 11 x 5 needs to be beside the number 55 or the word fifty-five. The dominos can be printed on A4 or A3 for larger tiles, glued to coloured cards (different colours for each set) and laminated. 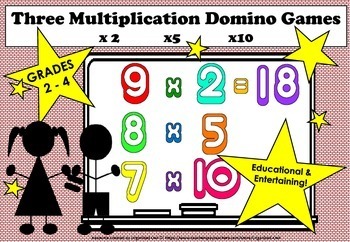 Used in math circles and at work stations this is a great way for children to learn their time tables while having fun!